Soapwort (saponaria officinalis) Also called "bouncing bet". Clumping green plant produces pale pink flowers when in bloom. Plant (all parts but especially the root) contains the compound saponin and will produce a lather similar to soap. 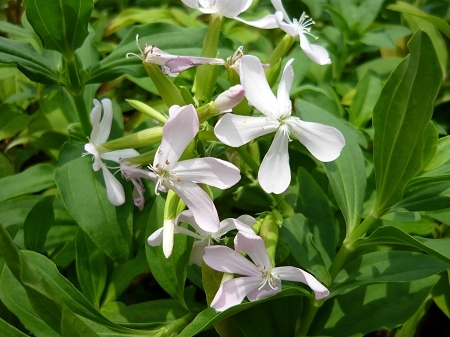 Traditionally soapwort has been used as a soap, skin rinse, shampoo, and a mild laundry detergent. Caution is advised, as some may experience eye irritation, and all parts of the plant may be poisonous if ingested. Perennial zones 3-9. One live plant. Live plant in 3 inch container.